Very little visible light provided so as not to disturb your animal's sleep patterns. Excellent for nocturnal viewing of all types of captive animals. 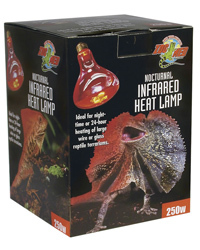 Spot reflector focuses more heat onto your reptile and minimizes night-time glare.